The girls laughed in the brightly colored church prep room, each taking turns applying Brooke's makeup and styling her hair. Brooke and Adam's wedding at their church in Green Bay was an intimate affair. They had gathered their nearest and dearest to celebrate this union that had been a long time coming. In a room nearby, the gentlemen relaxed with Adam and the couple's adorable son and ring bearer. The girls ducked in and out of the prep room, peeking around corners and doorways to make sure the bride stayed hidden, like a grownup game of hide-and-seek. 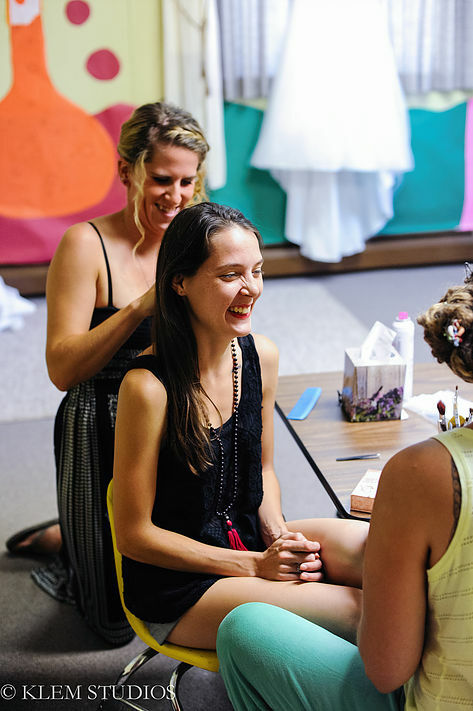 As Brooke's mom helped the bride into her wedding dress, Brooke's dainty figure and face came alive with excitement. 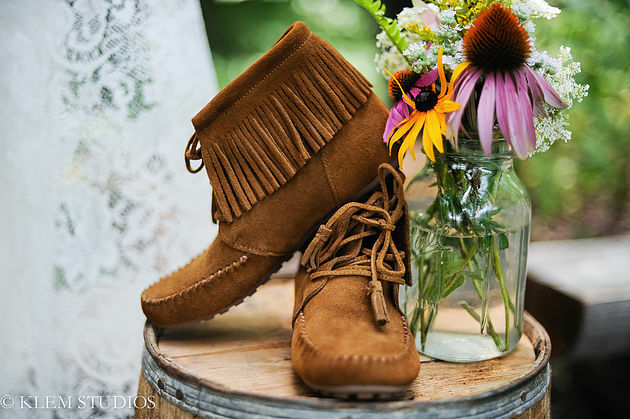 Brooke slipped her wedding moccasins onto her feet, a tribute to her native heritage. 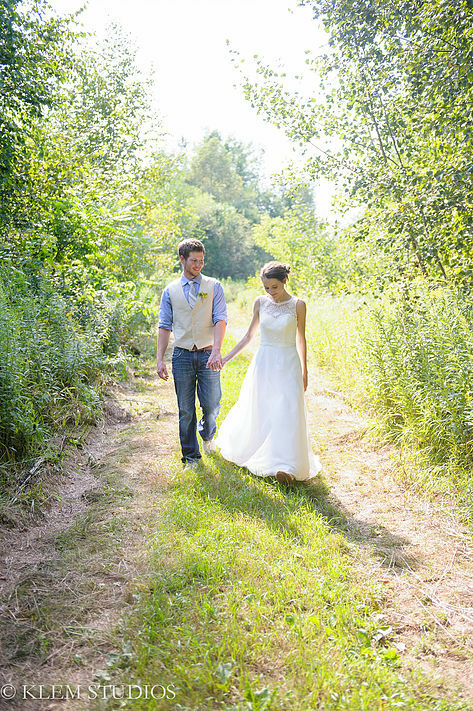 The sunlight danced through the trees of the outdoor wedding ceremony. Birch branches delicately draped with lace curtains served as an elegant backdrop for the couple's wedding vows. Adam gently ran his thumb across the top of Brooke's hand as they looked at each other, eyes full of love. They had been waiting for this day for a number of years, and they would be leaving this spot as husband and wife. 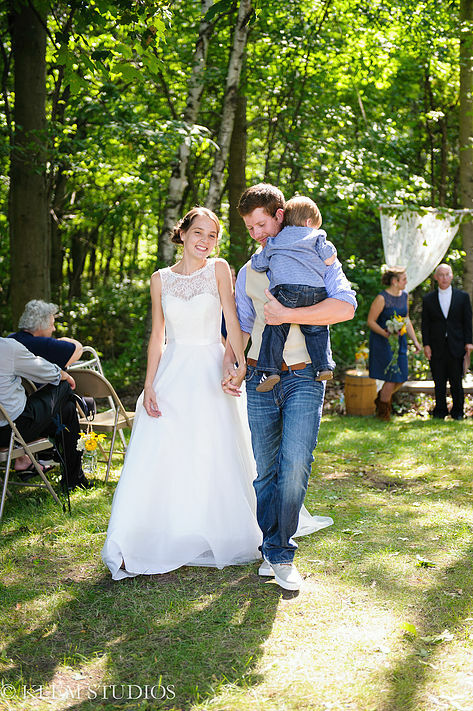 Brooke and Adam were swarmed with well-wishers at the conclusion of their ceremony. Their family and friends so clearly adore these two. The interactions they share with everyone are so tender, it feels as if you are intruding their special world just by observing it. It was heartwarming to be a part of. The couple strolled happily hand-in-hand, not daring to take their eyes off each other. Brooke's eye traced over Adam's every feature, engraining these moments in her memory, his gaze doing the same. Their love would only continue to grow from this day forward. Brooke and Adam, words cannot express how much I appreciate you two and the efforts it took for our partnership to be possible. You two so clearly understand the importance of photography and the relationship that comes with it. THANK YOU for that. Many blessings to you and your beautiful family, today and all the days after. A huge thank you to the beautiful Rose Hill Gardens for letting us walk amongst their beautiful flowers for some gorgeous photos!